Last month, Linkin Park’s frontman Chester Bennington took his own life at the age of 41 years old. The news shocked the music world, and put mental illness and depression at the forefront of health conversation. Especially after Chris Cornell killed himself earlier this year as well. Prior to his death, Chester and Linkin Park filmed an episode of the new series Carpool Karaoke, a spinoff of the popular segment on the Late Late Show With James Corden. The episode featured Linkin Park and actor Ken Jeong driving around and singing songs. In the midst of Chester’s passing, the episode’s status has been left up in the air. 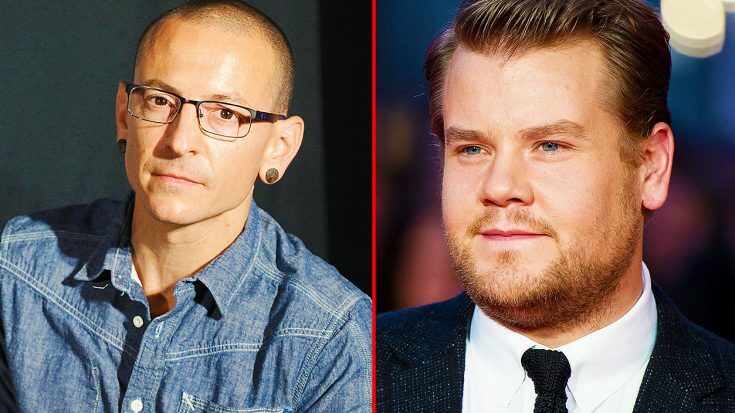 Recently, James Corden opened up about the episodes status, and said that it will be up to Chester’s wife, and the people involved, if the episode will air. “We will approach it in whichever manner his family, or the people that were involved in that episode, however they would like it to be handled. We consider it to be not our decision to make. We will navigate it as delicately as possible and just adhere to whatever wishes they would want to because I don’t think there’s any other way we could deal with it, really.“- Corden said. Bennington’s wife, Talinda, took to Twitter to personally thank Corden for handling the situation in a classy manner. We’ll see how it plays out, but props to Corden for being so classy!